I bought this as soon as it was available, despite reading poor reviews in the newspapers. Normally I take broadsheet reviews with a pinch of salt and stick with book blog reviews. There were not many of these reviews available so curiosity got the better of me. 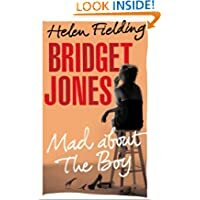 I went into this read open minded and with nice memories of the previous two novels about Bridget. She was young, scatty and in love. This book skips through to current times and she seems to have reversed her mental age. Annoying, needy, and maddeningly immature is how I would describe her. Now a widow, with two young children, she has no money worries and a limited circle of friends. She is just short of grabbing strangers off the street to play with her. If I was introduced to her, I would find her cute for all of 5 minutes and then run, with my children, as far away as possible. She can barely dress herself and maintain her household, despite having a cleaning lady and nanny and I would not be confident with her minding kids for 10 minutes, never mind raising two of her own. A lot of the book is written with text and twitter talk and after a while it gets exhausting. Although, Bridget's first attempts at understanding Twitter were quite funny, this wore off eventually. Her daughter appears to have a lisp and dreadful speech problems but these are not consistent and she is never corrected when she uses the wrong words. I think it is meant to be cute, but in fact is really annoying. Bridget's diary is full of capital letters and excessive punctuation and irritating "Gaaaaah"'s. When I asked a friend recently if the fact that I was struggling to read this book was a sign of me getting older, she suggested that perhaps it showed that Bridget just did not grow up. I now see her point. A terrible sequel, to be read with caution. May cause headaches with all the capital letters! This title is published by Jonathan Cape and is now widely available. I am just glad I got it half price! Great review - I am still debating over this one, I think I'll have to read it at some point but will wait a while. Will be reviewing your book tomorrow .... Aaaaaagh!